I arrived at my designated location on 33 Central Park West to sign in for my shift. Our shift was from 10AM to 6PM. I was assigned to “Zone 3” in the NYC marathon finish area. Zone 3 is a location 5 city blocks past the actual finish line. When you run the NYC marathon you are not actually finished when you complete 26.2 miles. That’s just part one. Part two is the additional mile walk that all runners must endure. It is the longest mile you can imagine, and your body has only one thought. It want’s to shut down. But no, you must keep walking. My Zone 3 comrades consisted of approximately 20 people who would strategically line the area that begins the split of runners who will be re-united with their personal effects – or those who just want to get out of Central Park. Our volunteer leaders informed us that we should expect anything, look for those needing medical attention, ways to give someone a helping hand, and to do our best to just keep everyone walking. Each volunteer was assigned a partner — so that at least one of you would be at your assigned location at all times. This would allow for taking a break to grab a quick bite to eat – or a mother nature moment. From what I could tell — none of the volunteers took any of their possible breaks. Not because we didn’t get hungry, or need a ‘moment’. We didn’t take any breaks because didn’t dare leave a potential runner in need – unattended. After the elite runners finished in 2 hours 15 minutes (and no – they did not have to walk the post finish mile+), the first trickle of finishers made their way to Zone 3. A few of these runners were even still running. I’m guessing they don’t have an ‘off switch’. Gradually the trickle of runners who had finished their marathon, grew into larger crowds. These are the people who finished their run sub-3 hours. I began making more eye contact with randomly selected finishers, and offered “Congratulations – you just finished the NYC marathon”. I looked for those struggling with keeping their heat wrap on – and offered to put their wrap around them. I looked for those who could not open their chocolate milk container, water bottle or pretzel bag – and offered to open it for them. I looked for those who still had energy and wanted to share their experience. I looked for those who just needed encouragement to keep walking. “How was it out there today?” I asked. And the finishers would reply with a story to tell me. Each story being unique and personal A story of 26.2 miles of support from the NYC crowds. A street party. Or, the difficulty running the quiet 59th Street Bridge. Or, the challenge of the hills at the end. Some were running their first marathon. And some said this would be their last marathon. Others expressed satisfaction making a time goal. Others missed a time goal, which gave them motivation to try again next time. Then, the finisher floodgates opened. For the runners who finish between 4 & 6 hours the masses of humanity needing attention from volunteers and medical staff overwhelmed the entire support system. Yet, we continued to dole out undivided attention to those who needed it. By now, the bodies of many finishers had used the last of their reserves. Walking like zombies, these finishers were opting to sit. I had to get creative. ‘Let’s make a deal’ type of creative. “If you only have a tiny bit of strength left, do you think you can keep walking? It will be so much harder to keep moving if you sit now.” For some, that encouragement worked and they continued walking. Others just needed to sit. I offered this group a different ‘deal’. “I know how much your body needs to sit. So go ahead. How about if I give you a hand to help you get back up in 3 minutes? Does that sound good to you?” And the deal-making went on for 2 solid hours. No detail was too small to serve. And this is what makes the NYC marathon a world class event. Every runner matters, and every volunteer was there to make that message known. 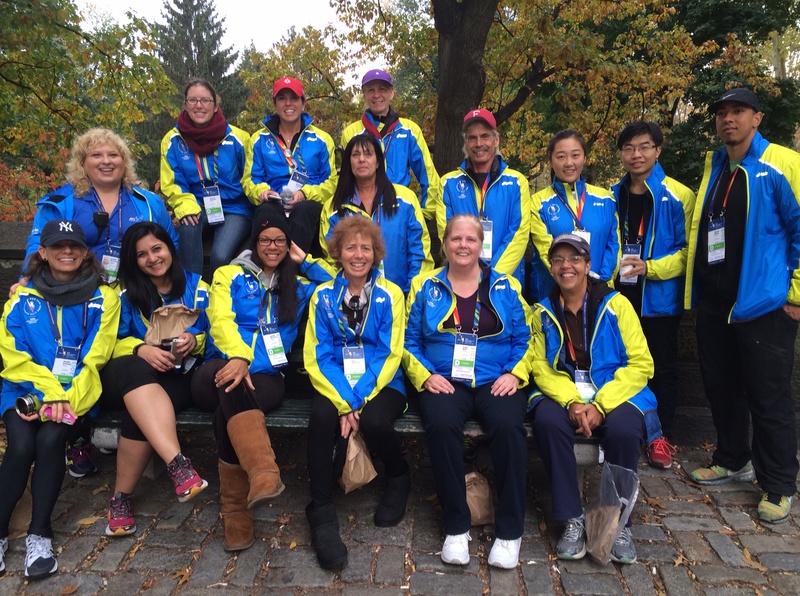 It was truly a thrill and an honor to be a NYC marathon official volunteer and wear the angelic halo – if only for a day. Your story and experience is priceless…..I am certain this experience cd left a big footprint on your soul……. Wow!! Kudos to you for your 8+ hours of support and giving. Wtg sissy!!! So proud of you. Thank you Jill and the experience truly left an imprint! Such kind and encouraging words. Thank you Buzz!! Congratulations on your finish and I enjoyed reading your post of your run in NYC! Thank you so much for volunteering! I too volunteered last year(heatsheets distribution), and I was so inspired that I went ahead and ran it this year. Thanks again for all your efforts and for such a detailed post! Congrats to you Cristina – both on your volunteering and running 26.2 this year!